A group of young J CB employees are jumping for joy after securing a place in the national finals of a competition to find the apprentice team of the year. 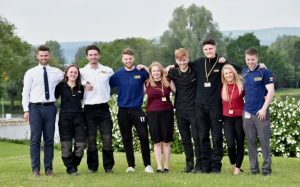 The contest – called the Brathay Apprentice Challenge – set 75 teams across the UK the task of promoting apprenticeships to businesses and young people. Now the nine-strong JCB group has reached the last eight of the competition after securing one of the highest point scores. They learn on June 14th if they have been crowned champions after taking part in a team building final. 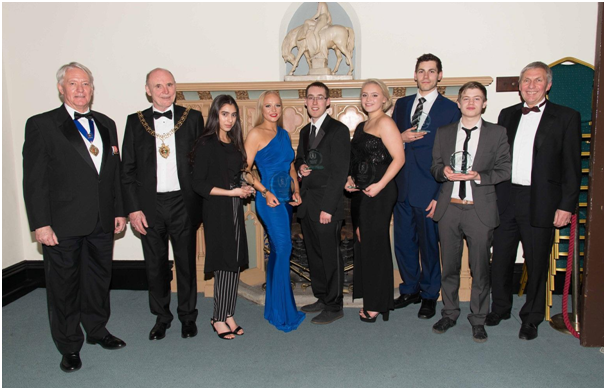 The JCB team comprises Joshua Gwilliam, 24, of Uttoxeter; Louise Meredith, 19, of Meir Heath, Stoke-on-Trent; Abigail Hodgson, 21, of Rugeley; Jade Holmes, 19, of Hilton, Derby; Sam Tozer, 21, of Duffield, Derby; Dominic Moore, 23, of Littleover, Derby; Ryan Thursfield, 22, of Cheadle; Adam Banton, 18, of Walsall and Harry Docker, 18, of Burton. Teaching assistant Zorah Lahrasab was one of the apprentice success stories highlighted at a recent awards night – where she was praised for the impact she has had on pupils’ lives. Zorah, aged 18, works at Joseph Cash Primary School after successfully completing a Level 3 Apprenticeship in Teaching and Learning at the school last year. She was shortlisted in the top three of her category for the 2016 Coventry Freemen’s Guild Apprentice of the Year Awards. And although she wasn’t the eventual winner, judges heard how she was a shining example to others and that her apprenticeship had given her a great start in what promises to be a long and successful career. Zorah has been a valued asset to the school from the moment she started work. She has learned to identify individual children’s needs and has helped to make a positive impact on pupils’ progress across Key Stage One. She also supports a child with severe autism and her ability to speak six languages means she regularly helps out with parents who do not have English as a first language – often using her skills to support them after school hours. Zorah is also able to use her creative skills to help the children enjoy after-school activities – helping with henna Mehndi and crafts. On one occasion when the school was having a pirate day, Zorah set up a craft afternoon so that all the children could make a hat, sword and eye patch as she realised that a lot of parents wouldn’t be able to afford a costume – although she thinks she enjoyed it more than the children did! Andy Hyland, Cathy Pallister and Hardip Shouker who are the Apprenticeship Team say: “We value apprenticeships very highly at the Council and around the city – we along with Adult Education are committed to providing first-class opportunities to give people the opportunity to start their chosen career. “Apprentices are making a real difference on a daily basis, as highlighted by the Awards and by people like Zorah. If you would like further information on apprenticeships please e-mail apprenticeships@coventry.gov.uk. I started at Wyre Forest District Council in October 2015 undertaking the Association of Accounting Technicians (AAT) qualification at the same time at Kidderminster College. Training as an apprentice I am fortunate to work with an experienced Internal Audit team, who are able to develop my audit skills and public sector knowledge and are always willing to take time to answer my many questions. The variation of work is the best attribute, each day working with a member of the Audit Team can involve recommending changes to systems, (as resources and money become tighter, we often have to find ways of doing more for less), internal control testing as part of the Internal Audit Plan to ensure processes and procedures are working well and collating and preparing detailed working papers. All of which has given me an insight into how a District Council works, and just what work is done often not seen by the public. I now understand that the role of Internal Audit is to protect the public purse. Internal Audit are often the team that colleagues will ask for advice if they are having problems or wish to change a process, and this can be challenging, but very rewarding as you feel you are contributing to how the Council functions. Whilst being mentored by the Senior Auditor, I have been able to contribute to reviews of changes both at our Depot site and Tourist Information Centre. I have also had the opportunity to assist the Corporate Fraud Officer in raising awareness of the Wyre Forest District Councils fraud campaign. In addition I have been able to observe the formal Committee process in action by Observing the Audit Committee, and attending the Treasury Management Training provided for Councillors. Working in a local government environment specifically Wyre Forest House with its open plan design has given me the ability to learn how an organisation functions as a whole and to interact with all levels of staff from Councillors, Directors, Managers Colleagues and fellow Apprentices. 2017 offers more opportunities I am hoping to complete AAT Level 3 this June and will apply to undertake Level 4 in September. I have been with Solihull Council for 5 months working as an Apprentice Civil Engineer for the Highways Projects team and I can safely say it is the best decision I could have made. I was 21 years old when I got the apprenticeship at Solihull Council and had previously attended College, been to University & had a full time job; however I was getting frustrated with myself at the lack of career progression for my age. Being employed onto this apprenticeship has given me a new motivation for my career and has laid out a clear path that can lead me to better myself for years to come from level 3 education right through to degree level. The team I have been placed in couldn’t have been more helpful and welcoming, I truly enjoy my job and working alongside my senior colleagues has given me an insight into what life could be like as a fully qualified Civil Engineer. A career in the Engineering industry was something that had always interested me from when I left school so to be able to learn all the things that interest me at college and then take them into the workplace to apply them to real world situations is the most benefitting position I could be in. In my opinion having that mix of experience and knowledge is unrivalled, especially in an engineering role; there is only so much a classroom can teach you about the varying and ever changing problems that a Civil Engineer can encounter from day to day so for me an apprenticeship is the best way to kick-start a rewarding career. If I could go back to being a 16 year old school leaver, I would choose the apprenticeship path without a moment’s hesitation. 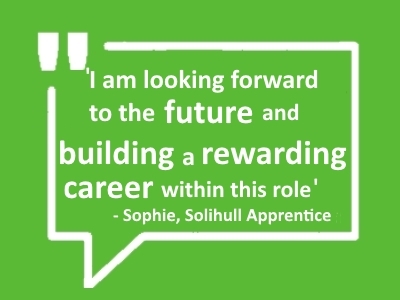 When I applied for the Payroll Apprenticeship at Solihull council, I did not know what to expect. I had a understanding of what payroll was, however I did not expect how much there was to learn till I got stuck in. During my apprenticeship I was working towards a Level 2 Business Admin qualification, I had the support of the team and managers to get me through the apprentice. On completing my apprenticeship, I have been selected to do the CIPP Foundation Degree in Payroll Management, this will enable me to progress further and gain the relevant knowledge needed. I would recommend anyone who is unsure what to do when they leave school or college to look at an apprenticeship. When I first thought about applying to be an electrical apprentice, I was very hesitant and sceptical. But after being a part of an apprenticeship with Solihull metropolitan council for 6 month now. I can honestly say that it was best decision I have ever made. I have been happily welcomed by the members of the SMBC Street Lighting department; I have found them to be very helpful and supportive not just in helping me in acquiring my qualification but in general life skills. Because of this, it has boosted my independence and confidence. When anyone asks what an apprenticeship is like, I readily encourage people to apply to join apprenticeship. It’s a great opportunity, not just to gain a good qualification, that will accelerate your career, but also to gain life skills that will help you though the future. Coventry and Warwickshire apprentices had the chance to talk about their training with a government minister when he visited the region. 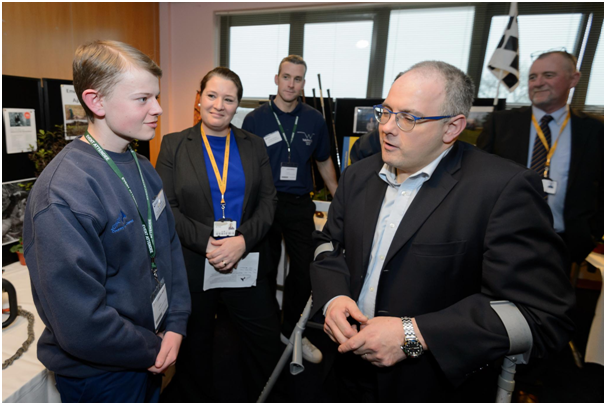 Robert Halfon, the Minister of State for Apprenticeships, visited Warwick Trident College to see how Warwickshire College Group (WCG) works with apprentices. He was looking into how apprentices have been combining work, learning and education. Mr Halfon toured some of the college’s training workshops and met apprentices working in a variety of areas, from farriery to accountancy and dentistry to horticulture. 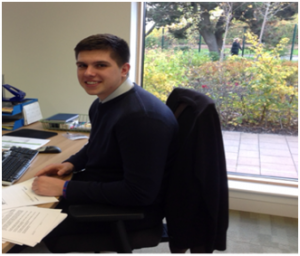 Billy Kelly, one of the Council’s apprentices, was among those who spoke with the Minister. Billy, a Horticulture Apprentice at Bereavement Services, who trains through Warwickshire College, said: “It was a great honour to be able to share what I’ve done and to represent what the Council has to offer for the younger generation. Looked after children are getting new skills and experiences thanks to apprenticeships at the Council. Four young people are working as council apprentices in business admin, horticulture, job coaching and as a health and physical activity leader. Two more are due to start this month. Natasha was working in a fast food restaurant before she met the Apprenticeship Team and was matched with the Employment Service. “It’s been nine months now, I am still here and I absolutely love it. “I support people with severe to moderate mental health issues and / or learning disabilities into employment. We offer tailored support around each individual as everyone that we work with is different. “I have the most amazing team around me who have supported me with everything since I started. I was made to feel extremely welcome from the moment I took on my apprenticeship and still to this day I am seen as a very important and valid team member. Natasha hopes to become a Police Officer or Family Liaison Officer when she completes her apprenticeship. “It’s so important that we give the children we care for opportunities to succeed and develop. “Supporting and helping them into work and preparing them for life is what any good parent does – and that includes us as corporate parents.